For other uses, see Karate Kid (disambiguation). In September 1984, 15-year-old Daniel LaRusso moves with his mother Lucille from Newark, New Jersey to Reseda, Los Angeles, California. Their apartment's handyman is an eccentric but kindly and humble Okinawan immigrant named Keisuke Miyagi. Daniel befriends Ali Mills, an attractive high school cheerleader, which draws the attentions of her arrogant ex-boyfriend Johnny Lawrence, a skilled practitioner from the "Cobra Kai" dojo, where he studies an unethical and vicious form of karate. Johnny and his Cobra Kai gang continually torment Daniel, savagely beating him until Mr. Miyagi intervenes and single-handedly defeats the five attackers with ease. Amazed, Daniel asks Mr. Miyagi to be his teacher. Miyagi refuses, but agrees to bring Daniel to the Cobra Kai dojo to resolve the conflict. They meet with the sensei, John Kreese, an ex-Special Forces Vietnam veteran who callously dismisses the peace offering. Miyagi then proposes that Daniel enter the All-Valley Karate Championships, where he can compete with Johnny and the other Cobra Kai students on equal terms, and requests that the bullying cease while Daniel trains. Kreese agrees to the terms, but warns that if Daniel does not show up for the tournament, the harassment will continue on both Daniel and Miyagi. Daniel's training starts with menial chores that he believes only makes him Miyagi's slave. When he becomes frustrated, Miyagi demonstrates that these actions have helped him to learn defensive blocks through muscle memory. Their bond develops and Miyagi opens up to Daniel about his life that includes the dual loss of his wife and son in childbirth at the Manzanar internment camp while he was serving with the 442nd Infantry Regiment during World War II in Europe, where he received the Medal of Honor. Through Mr. Miyagi's teaching, Daniel learns not only karate but also important life lessons such as the importance of personal balance, reflected in the principle that martial arts training is as much about training the spirit as the body. Daniel applies the life lessons that Miyagi has taught him to strengthen his relationship with Ali. At the tournament, Daniel surprises everyone by reaching the semi-finals. Johnny advances to the finals, scoring three unanswered points against a highly skilled opponent. Kreese instructs Bobby Brown, one of his more compassionate students and the least vicious of Daniel's tormentors, to disable Daniel with an illegal attack to the knee. Bobby reluctantly does so, severely injuring Daniel and getting disqualified in the process. Daniel is taken to the locker room, with the physician determining that he can't continue, but Daniel believes that if he does not continue, his tormentors will have gotten the best of him. He convinces Miyagi to use a pain suppression technique to allow him to finish the tournament. As Johnny is about to be declared the winner by default, Ali tells the master of ceremonies that Daniel will fight. The match is a seesaw battle, as neither is able to break through the other's defenses. The match is halted when Daniel uses a scissor leg technique to trip Johnny, deliver a blow to the back of the head and give Johnny a nose bleed. Kreese directs Johnny to sweep Daniel's injured leg, an unethical move. Johnny looks horrified at the order, but reluctantly agrees under Kreese's intimidation. As the match resumes, Johnny seizes Daniel's leg and delivers a vicious blow, doing further damage. Daniel, standing with difficulty assumes the "Crane" stance, a technique he observed Mr. Miyagi performing on the beach. Johnny lunges toward Daniel, who jumps and delivers a front kick to Johnny's face, winning the tournament. Johnny, having gained newfound respect for his nemesis, takes Daniel's trophy from the Master of Ceremonies and presents it to Daniel himself as Daniel is carried off by the enthusiastic crowd. 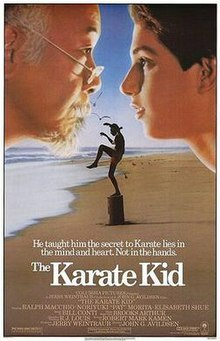 The production needed to obtain permission from DC Comics to use the Karate Kid title due to DC's existing ownership of the character, Karate Kid. According to the special-edition DVD commentary, the studio originally wanted the role of Mr. Miyagi to be played by Toshiro Mifune, but writer Robert Mark Kamen was opposed to that casting choice feeling that Mifune's interpretation of the character lacked the warmth and humor that the role needed. Mako was also considered for the role of Mr. Miyagi, but was not available due to prior commitments to film Conan the Destroyer (1984), though he would eventually play a similar role in the film Sidekicks (1992). According to Randee Heller, two days after she was cast, Jerry Weintraub informed her that they intended to replace her with Valerie Harper. John G. Avildsen said that after seeing Harper's audition they decided not to replace Heller after all. Filming began on October 31, 1983, and wrapped on December 16, 1983. The musical score for The Karate Kid was composed by Bill Conti, a frequent collaborator of director John G. Avildsen since their initial pairing on Rocky (1976). The instrumental score was orchestrated by Jack Eskew and featured pan flute solos by Gheorge Zamfir. On March 12, 2007, Varèse Sarabande released all four Karate Kid scores in a 4-CD box set limited to 2,500 copies worldwide. A soundtrack album was released in 1984 by Casablanca Records containing many of the contemporary songs featured in the film. Of particular note is Joe Esposito's "You're the Best", featured during the tournament montage near the end of the first film. Originally written for Rocky III (1982), "You're the Best" was rejected by Sylvester Stallone in favor of Survivor's hit song "Eye of the Tiger". Coincidentally, Survivor also performed the main theme ("The Moment of Truth" Music & Lyrics: Bill Conti, Dennis Lambert, Peter Beckett) for The Karate Kid. Bananarama's 1984 hit song "Cruel Summer" also made its U.S. debut in The Karate Kid but was excluded from the film's soundtrack album. Other songs featured in the film but left off the album include "Please Answer Me" performed by Broken Edge and "The Ride" performed by The Matches. The Karate Kid ranked #40 on Entertainment Weekly's list of the 50 Best High School Movies. The film received an approval rating of 88% on review aggregator Rotten Tomatoes based on 43 reviews, its consensus reads: "Utterly predictable and wholly of its time, but warm, sincere, and difficult to resist, due in large part to Pat Morita and Ralph Macchio's relaxed chemistry." On its release, Roger Ebert called the film one of the year's best, gave it four stars out of four, and described it as an "exciting, sweet-tempered, heart-warming story with one of the most interesting friendships in a long time." Janet Maslin of The New York Times also gave a positive review. "The 1984 original ... may have seemed like a standard-issue inspirational sports picture at the time, but (as with another box-office hit of the same year, The Terminator) a generation of remove reveals what a well-crafted movie it actually was. Rewatched today, the original Kid, directed by Rocky's John G. Avildsen, feels smart and fresh, with a wealth of small character details and a leisurely middle section that explores the boy's developing respect for his teacher." The music video for the song "Sweep the Leg" by No More Kings stars William Zabka (who also directed the video) as a caricature of himself and features references to The Karate Kid, including cameo appearances by Zabka's former Karate Kid co-stars. Kove and Zabka appeared on an episode of Tosh.0 as their original characters for "Board Breaker Web Redemption". The skit was inspired by a viral video made by Josh Plotkin, where he talked about accomplishing goals through believing in yourself. The skit spoofed the final fight of the movie. At the end of the skit, Daniel Tosh, dressed as Mr. Miyagi, honks Kove's nose, a reference to Mr. Miyagi's action in the scene at the beginning of The Karate Kid, Part II. Macchio and Zabka made a guest appearance as themselves in the How I Met Your Mother episode "The Bro Mitzvah". In the episode, Macchio is invited to Barney Stinson's bachelor party, leading to Barney shouting that he hates Macchio and that Johnny was the real hero of The Karate Kid. Towards the end of the episode, a clown in the party wipes off his makeup and reveals himself as Zabka. The Next Karate Kid (1994): A revamp sequel in which Hilary Swank appears as Mr. Miyagi's new student, Julie Pierce. On August 4, 2017, it was announced that a new half-hour dramedy TV series was in development to continue the Karate Kid franchise. The series, titled Cobra Kai, will reunite Ralph Macchio and William Zabka who reprise their roles as Daniel LaRusso and Johnny Lawrence respectively. The show was set 34 years after the original film, focusing on Johnny who is down on his luck and re-opens the Cobra Kai dojo on his search for redemption. This puts him at odds with Daniel, who, though successful, is trying to find balance in his life without Mr. Miyagi. Josh Heald wrote the script with Jon Hurwitz and Hayden Schlossberg while the latter duo directed most of the series, they also executive-produce alongside Macchio and Zabka. The series received an order of 10 episodes for the first season which debuted on YouTube Premium in May 2, 2018. ^ "THE KARATE KID (PG)". British Board of Film Classification. July 2, 1984. Retrieved June 8, 2015. ^ Straight to DVD: Original "Karate Kid" on Blu-ray. Salon.com. Retrieved June 14, 2013. ^ "The Karate Kid". Box Office Mojo. Internet Movie Database. Retrieved 2018-12-14. ^ "The Karate Kid". Allmovie. Rovi Corporation. Retrieved April 28, 2011. ^ Maslin, Janet. "The Karate Kid (1984)". The New York Times. Retrieved April 28, 2011. ^ "Karate Kid Q&A W/Director John G Avildsen & Cast Part 1". YouTube. H Dellamorte. Event occurs at 11:47. Retrieved 4 March 2017. ^ "The Karate Kid". www.varesesarabande.com. Archived from the original on 2007-07-03. Retrieved 2007-03-15. ^ "50 Best High School Movies". Entertainment Weekly. 2008-07-31. ^ Ebert, Roger (January 1, 1984). "The Karate Kid". Chicago Sun-Times. Chicago Sun Times. Retrieved 2009-10-07. ^ Maslin, Janet (June 22, 1984). "SCREEN 'KARATE KID,' BANE OF BULLIES". The New York Times. Retrieved 2010-05-21. ^ Stevens, Dana (June 10, 2010). "The Karate Kid". Slate. ^ "1984(57th)-Actor in a Supporting Role". Academy of Motion Picture Arts and Sciences. Retrieved August 30, 2018. ^ "Winners & Nominees: The Karate Kid". HOLLYWOOD FOREIGN PRESS ASSOCIATION®. Retrieved August 30, 2018. ^ Powell, Larry; Garrett, Tom (20 December 2013). "The Films of John G. Avildsen: Rocky, The Karate Kid and Other Underdogs". McFarland. Retrieved 28 December 2017 – via Google Books. ^ M.D, Lyle J. Micheli (17 November 2010). "Encyclopedia of Sports Medicine". SAGE Publications. Retrieved 28 December 2017 – via Google Books. ^ Campbell, Christopher (June 6, 2010). "William Zabka-Directed Music Video, 'Sweep the Leg, Johnny'". Moviefone. AOL. Retrieved December 1, 2016. ^ Gonzalez, Sandra (April 29, 2013). "'How I Met Your Mother' recap, 'Bro Mitzvah': The REAL Karate Kid". ew.com. Retrieved May 12, 2018. ^ "The Karate Kid (1984) Action Figures have been Revived by Funko". Z.Love's Entertainment Blog. 2015-10-10. Retrieved 2015-10-10. ^ "Original Karate Kid Is Returning To Theatres For 35th Anniversary". Movieweb. February 4, 2019. Retrieved February 5, 2019. ^ Thurber, Jon (2005-11-26). "Pat Morita, 73; Actor Starred in 'Karate Kid' Movie Series". The Los Angeles Times. Retrieved 2010-08-25. ^ "Jackie Chan set for 'Karate' remake - Entertainment News, Film News, Media". Variety. 2009-07-13. Retrieved 2009-07-13. ^ Goldberg, Lesley (August 4, 2017). "'Karate Kid' TV Sequel, Starring Ralph Macchio and William Zabka, a Go at YouTube Red". The Hollywood Reporter. Retrieved August 5, 2017. ^ Romano, Nick (August 4, 2017). "Karate Kid sequel series reuniting Ralph Macchio, William Zabka". Entertainment Weekly. Retrieved August 5, 2017.